This is bound to be a very controversial recipe to be shared on this website. Not too long ago, I shared a picture on our Facebook page of a delicious salad I was enjoying and it sparked a lot of attention. This is the result of the fact that I topped the salad with some homemade ricotta cheese. For the most part, feedback from our followers was quite positive, but it seemed to cause an upset for some. This is due to the fact that cheeses are considered one of those grey area options on the diet, as are most other forms of dairy. There are several arguments as to why one should avoid dairy, but I won’t go into too much detail about this now, as it’s a topic we’ve covered thoroughly in the article on the place of dairy on a Paleo diet as well as the article on Paleo 2.0. I also already shared a recipe for some delicious homemade yogurt, which can be a good way to include more healthy probiotics in your diet. The important thing to remember when considering consuming dairy is your current health status, your personal tolerance to dairy and the choice of dairy itself. It’s in no way bad to include dairy in your diet, but it’s best to do so when you’re in the right position for it. The best choices are the dairy sources coming from organic and grass-fed animals and goat or sheep’s milk is also generally better tolerated. Finally, fermented dairy is also often a better idea because of the probiotic it provides and because of the fact that it contains a lot less lactose. Perhaps the best thing about this recipe is that it is far from being complicated and it doesn’t take long to prepare. This certainly took me by surprise, as I was always under the impression that making cheese was quite timely and required exceptional attention to detail. In truth, I only had to dump everything into a pot, let it boil, cool and then strain the whey from the cheese. Aside from that, it’s just a matter of time. 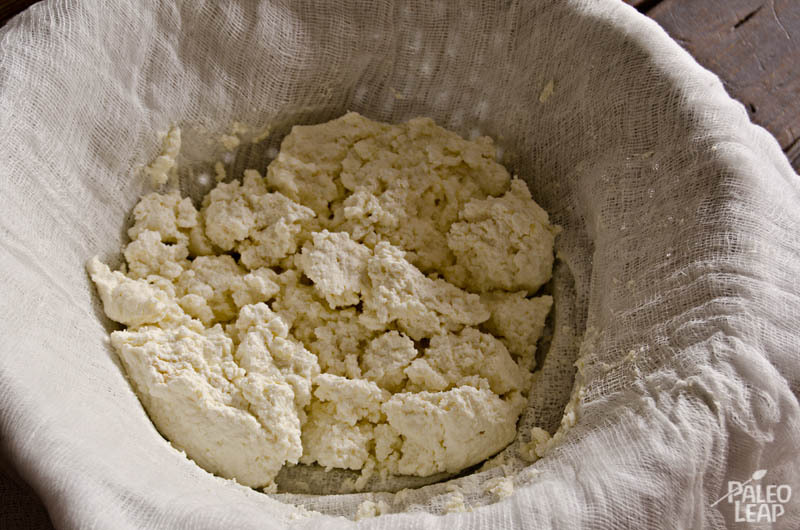 It’s good to remember though that this is a very fresh ricotta cheese without any fermentation or aging period so the taste is very mild compared to other, more tangy, cheeses. The only thing that you’ll want to pay close attention to is how much lemon juice you include. It can be difficult to gauge, as some lemons can be more fresh and/or concentrated than others, so the results will be different. Essentially, you’ll want to add enough lemon juice so that all the dairy curdles on the surface of the pot. This may not make total sense as you read this, but upon making the recipe you’ll get it. If you’re including cheese in your diet for the first time it can be quite exciting, as it can really add taste to a dish. As I already mentioned, it’s great on salads, but there are several other ways to enjoy it. You can sprinkle it a top of your eggs in the morning, or have it with fresh berries and peaches. It’s also great to include in any kind of smoothie. 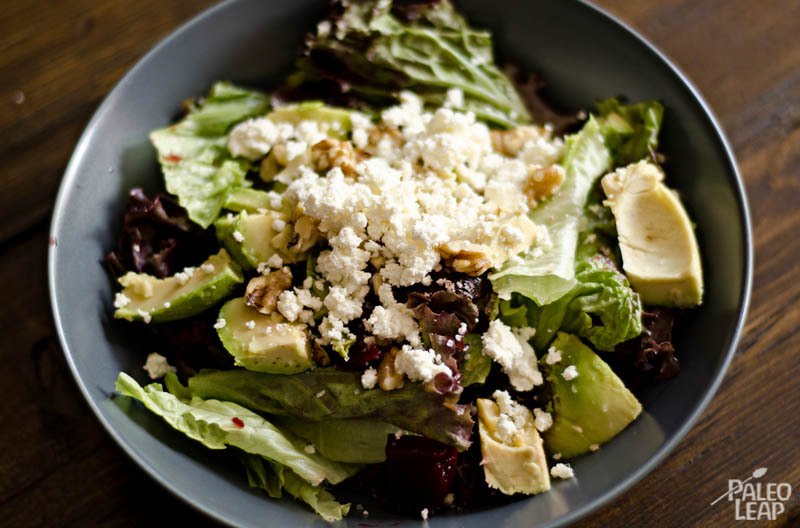 Here I sprinkled it on a simple salad of mixed organic greens, avocado and walnuts. I topped it all off with a simple olive oil and lemon juice vinaigrette. In a large saucepan over a medium-high heat, combine the whole milk, cream, lemon juice and salt. 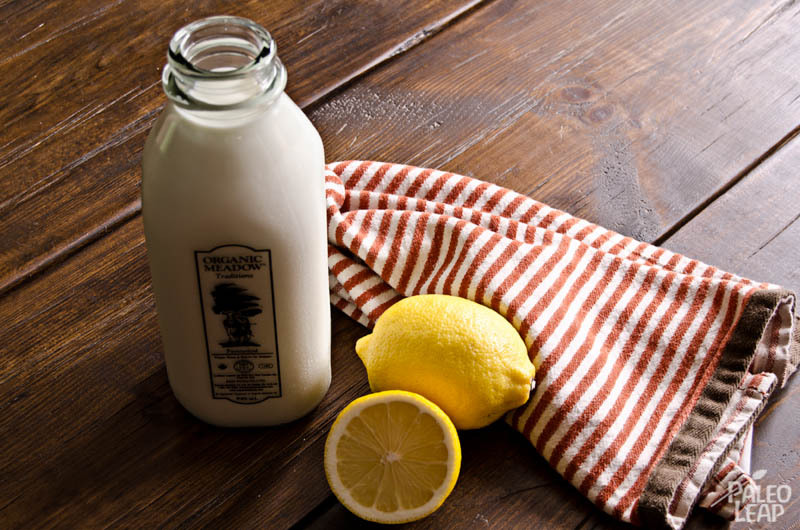 Stir briefly, yet thoroughly to ensure the lemon juice is mixed throughout the dairy. Avoid stirring after this point, as the curds (which are actually the cheese) will begin to form and you don’t want to disrupt their shape. Allow the mixture to come to a boil. Once the mixture has reached a boil, remove from the heat and allow it to cool for at least 15 minutes. At this point, the whole surface should be curdled. If not, you’ll have to add more lemon juice and return to the heat for a few moments. Line a colander with the cheese cloth (the cloth should be folded enough to form 5 to 6 layers). Place the colander in a large bowl, which will collect the whey as it drains from the cheese. Once the mixture has cooled, use a large spoon to scoop out the curdled cheese and place it in the colander. Continue to do so until only the whey is left over in the pot. Once finished, leave the cheese on the counter still in the cheese cloth and allow it to continue to drain for anywhere from 30 minutes to an hour. After 30 minutes, you may want to wring the cheese out by using the cheese cloth. Keep in mind that the longer the cheese is left to drain at room temperature, the more flavourful it will be. Store the cheese in an air tight container in the fridge. It should keep for a week or two without any problem, but I’m sure you’ll be like me and eat it up way before that time.